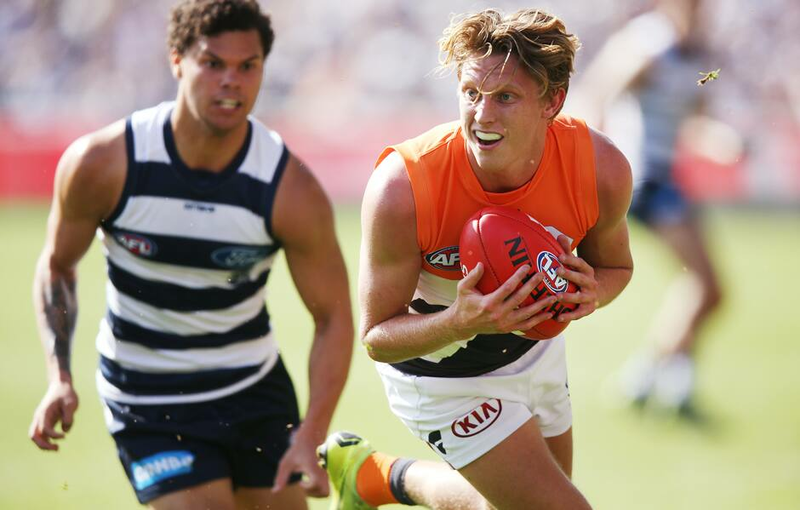 Lachie Whitfield runs with the football during the GIANTS' historic win over the Cats in Geelong. Lachie Whitfield has become the third GIANT to receive the perfect 10 votes in the Shadforth AFLCA Champion Player of the Year Award. Hot on the heels of Jeremy Cameron in round three and Stephen Coniglio in round one, Whitfield was deemed best on ground by GIANTS coach Leon Cameron and Geelong coach Chris Scott during the GIANTS’ round four win over the Cats at GMHBA Stadium. The ultra-versatile Whitfield racked up 31 disposals, took 10 marks and sent the ball inside 50 five times during the historic four point win; the GIANTS’ first win ever against the Cats in Geelong. The 24-year-old now sits sixth on the leaderboard with 23 votes and is one of only six players across the competition to have recieved votes in every game this year. Whitfield sits ahead of teammates Jeremy Cameron (eight with 18 votes) and Stephen Coniglio (equal ninth on 17 votes). Whitfield, Cameron and Coniglio were all included in AFL.com.au’s Team of the Week, with Cameron’s three goal and 15 disposal performance earning him three coaches votes, while Coniglio’s 34 disposals and 10 clearances earned him five votes. Young midfielder Jacob Hopper, who is enjoying his best start to a season having completed his first full pre-season, was unlucky to not make the Team of the Week but did earn seven votes from the coaches. The 22-year-old won 16 contested possessions amongst his 31 disposals, laid six tackles and created two goal assists in one of his most impressive performances to date. Meanwhile, Harry Himmelberg’s courageous mark in the final quarter of Saturday’s win has been nominated for the round four JLT Mark of the Year. Going back with the flight of the ball, Himmelberg put aside any regard for his personal safety and took a mark that has since been compared to marks by Brisbane champion Jonathan Brown and St Kilda legend Nick Riewoldt. Shadforth AFLCA Champion Player of the Year Award.